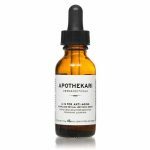 My sensitive skin cannot tolerate prescription retinoids or other harsh retinols on the market today, but is loving the new Apothekari A is for Anti-Aging Retinal serum. It goes on without any greasiness and feels velvet smooth upon application. My skin has shown no signs of redness or flaking and after just a few weeks of use, it is noticeably brighter and smoother. Hooray!